Former state environmental official and current Appalachian Voices advocate Amy Adams (whose coal ash-covered hand graced hundreds of articles in the aftermath of the Dan River disaster last year) has written a highly instructive and disturbing explanation of the proposal in the current “regulatory reform” bill wending its way through the General Assembly to, in effect, eviscerate one of North Carolina’s most important anti-water pollution laws. Buffers are an important concept in acid-base chemistry. A buffer is an aqueous solution that has a highly stable pH. 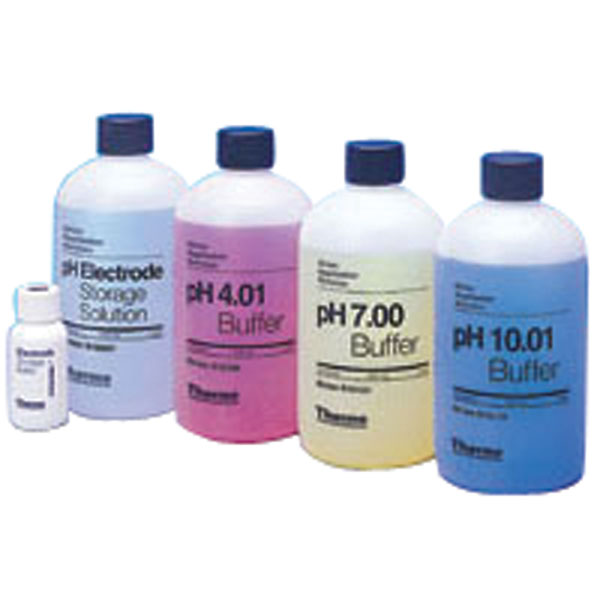 If you add acid or base to a buffered solution, its pH will not change significantly. Also, adding water to a buffer or allowing water to evaporate will not change the pH of a buffer. Similarly, in ecosystems, a riparian buffer, (otherwise known as the strip of forest that runs adjacent to our streams and rivers) neutralizes many of the “acids” or “bases” coming of the land into the river. 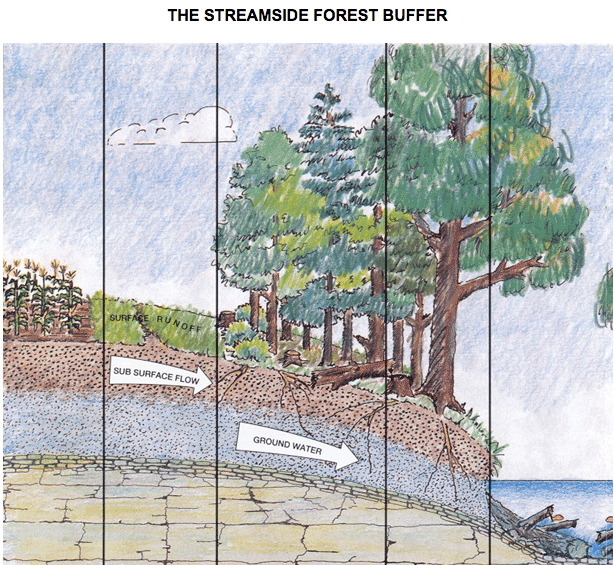 These stream buffers filter stormwater runoff before it enters the stream. The vegetation within the buffer absorbs the excess nutrients that enter our waters and cause algae blooms and fish kills. The outer reaches of the buffer (the most landward sections) slow and spread out the flow of water coming off the land. Slowing down the rainwater runoff traps the sediments and the attached pollutants and helps it infiltrate into the ground rather than flow across it. This infiltration, in turn, allows the vegetation within the inner reaches (closest to the stream) to absorb the nutrients. North Carolina holds stewardship of the second largest estuarine complex in the lower 48 states (the Albemarle-Pamlico Estuary) and buffers are a critical part of maintaining the health and balance of this extremely important resource. The critical importance of sustaining the estuarine system was reflected in its Congressional designation as an “Estuary of National Significance” in 1987. • Along rivers and streams, the roots of the vegetation within the buffer stabilize the streambank. • Along estuaries and large eastern rivers, they dampen wave actions and absorb floodwaters. • The buffers along rivers and streams keep water temps cool from their shade, and provide both structure(fallen limbs) and food to the stream ecosystem. • the beauty of healthy, vegetated floodplains is economically valuable – attracting and supporting water-based recreation and ecotourism, and increasing the market value of nearby properties. The adoption of the buffer rules was considered a great collaborative success and was backed by science, stakeholders, and regulators. Now, nearly 20 years later, however, our representatives in Raleigh are set to make changes to where the rules apply that essentially eliminate buffers, without considering the science and without stakeholder input. Interestingly, it should be noted that these buffers are also a key component of the federal requirements to control water pollution imposed on North Carolina. Without the use of buffers, the mandated reductions will have to come from other sources, like agriculture and municipalities discharges. Sadly, this is just one of many bad environmental bills rolling through our legislative building this year. For a helpful and disturbing summary, check out this recent article in the Charlotte Observer. 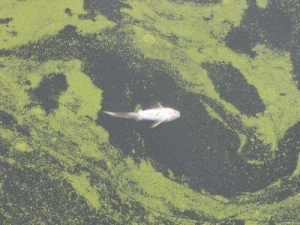 The bottom line: Unless elected officials come to their senses and soon, North Carolinians should prepare to say “bye, bye” to their streamside buffers and “hello” to degraded estuaries, more algae blooms, and fish kills.